Yesterday, the Los Angeles City Council approved the largest transit-oriented development near a new Expo Line Station in Los Angeles’ Westside. The development, located at the 4.7 acre site owned by the Martin Automotive group sits at corner of Olympic Boulevard and Bundy Drive. 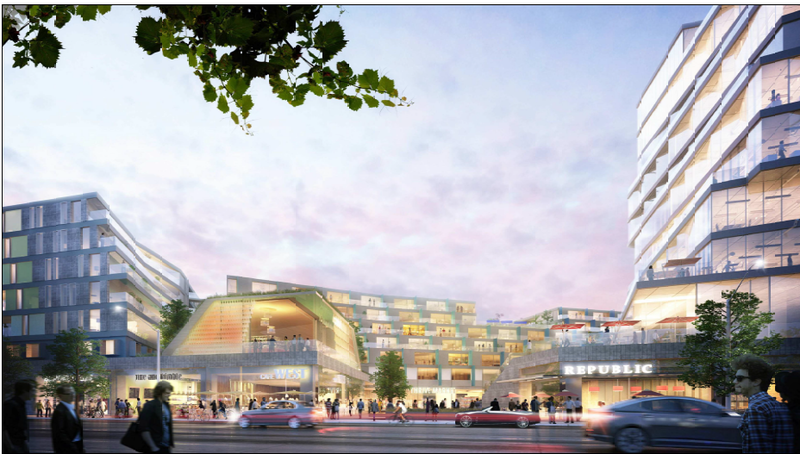 The project is mixed use, with significant housing, 150,000 feet of neighborhood-serving retail, genuine transit-integrating features, and shared public spaces. “Martin Expo Town Center includes a higher percentage of affordable housing than any project of this kind in the history of Los Angeles, it features neighborhood-serving retail and an exceptional pedestrian plaza, it will create thousands of permanent jobs, and it offers needed additional parking for the nearby Expo/Bundy station that will help connect more people with mass transit,” writes L.A. City Councilmember Mike Bonin who represents the district where the project is located. The development will have over 516 housing units, 20 percent of which will be affordable housing and five percent of which will go to house the recently homeless. The original proposal did not have an affordable housing component. Naturally, the project is not universally popular. 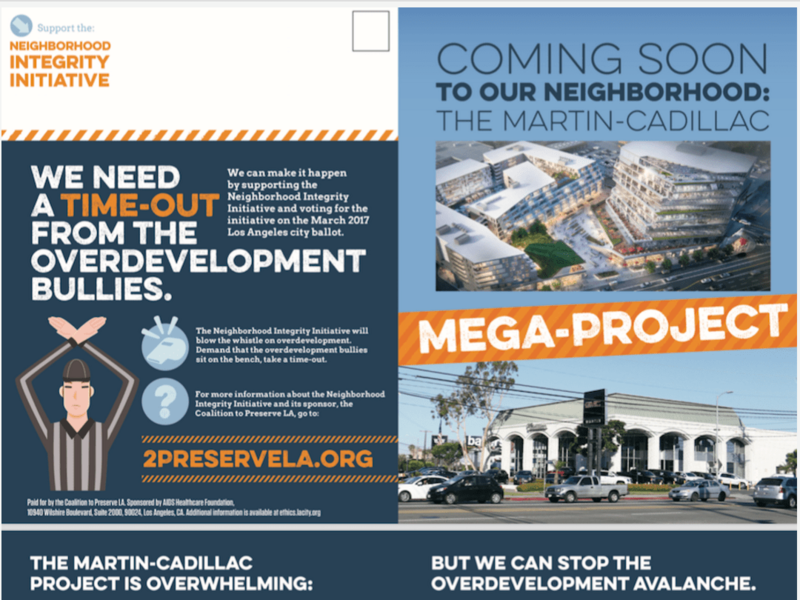 The Coalition to Preserve L.A. mailed a full-color glossy brochure to Westside residents this summer encouraging them to fight the project. The coalition was working with a who’s-who of Westside residents’ and homeowners groups including West of Westwood Homeowners Association, West L.A.-Sawtelle Neighborhood Council, Brentwood Homeowners Association and Westwood South of Santa Monica Blvd. Homeowners Association. Many of the features bragged about in Bonin’s press materials were slammed in the Coalition’s piece. From the coalition’s website. As noted in the Coalition to Preserve L.A. mailer, Martin Expo Town Center will jam 516 residential units and at least 150,000 square feet of office space on the Martin Cadillac site, and will create 7,151 more car trips daily and 16 new gridlocked intersections. It also seeks a half-dozen on- and off-site liquor licenses and permits for live entertainment. Taken on my iphone, on the way to a pre-schooler’s birthday party, in August. The project does have a multi-modal transportation component, which Bonin feels mitigates any increased traffic the project will create. The parking plans include 100 car spaces reserved for Expo Line users and over 600 short- and long-term bicycle parking spaces. Some of the spaces will be reserved for a car share program. Others will be reserved for e-vehicle charging. In addition, the developer will work with Metro to provide transit passes for residents at a discount paid for by the development. Last, Bonin points out that they negotiated for the developer to pay for other improvements to protect the neighborhood from increased car traffic. The developer will pay for a raised median on Bundy to prevent illegal left turns and cut through traffic near the development. It has also committed to fund $250,000 for the installation of a traffic signal at the Olympic entrance if the neighborhood wants it. But these accommodations are not enough for many Westside residents’ groups. According to the Coalition to Preserve L.A. website, these groups are angry that a “spot-zoning” agreement was ratified by the City Council without a hearing by the Planning and Land Use (PLUM) Committee. The PLUM Committee was scheduled to hear the proposal last week, but, according to Committee Chair and Councilmember Jose Huizar a filing error forced them to scrap the planned hearing. Rather than waiting for two weeks until the next hearing, the full City Council held the hearing earlier this week on Tuesday. The filing screw-up is giving more rhetorical ammunition for the Coalition to Preserve L.A., which is not just fighting local transit-oriented development, but also pushing the Neighborhood Integrity Initiative, which would put a two year moratorium on any spot-zoning that is on the ballot in March of 2017. 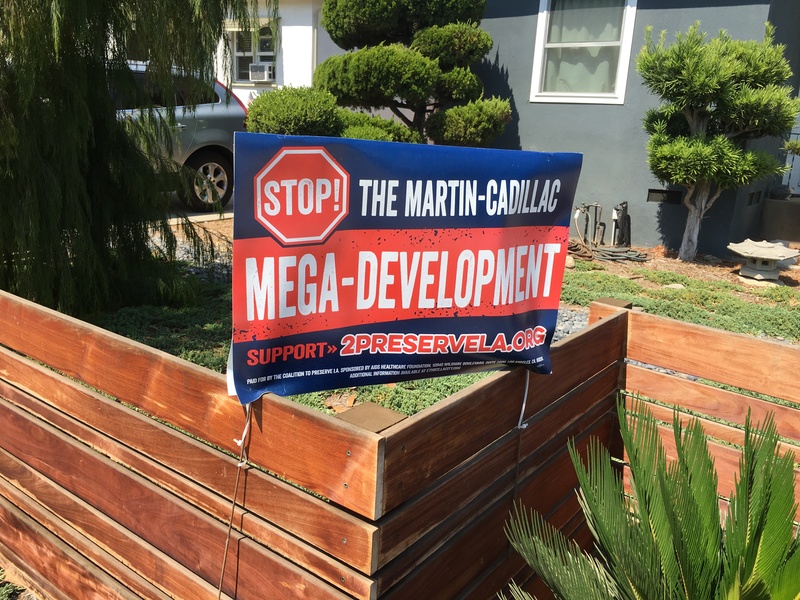 “City Hall’s handling of the mega-project, which needs the Council’s approval, only underscores the need to reform L.A.’s broken and rigged planning and land-use system that consistently favors deep-pocketed, politically connected developers,” writes former L.A. Weekly reporter Patrick McDonald on the Coalition’s website. If the Coalition sees the project as a defeat for the community and the process, Bonin sees the project completely differently. Nice! Putting lots of housing (including affordable housing!!!) and jobs near transit stations is exactly what we need to be doing to tackle the housing crisis and give people more chances to get around without having to drive, or drive as much. Damn evil greedy developers, building places for people to live! How dare they! All that extra stuff they’re promising to do is a lot and I’d be surprised if they did any of it. This is what the City Council does. They changed the meeting so they would not get objections or problems. I don’t know why they even bother doing that. Because even when people have objections, the council flat out ignored them and does whatever they want anyway. Why are they falling all over themselves touting the amount of Expo parking and more to the point why doesn’t Streetsblog call them on it? It’s their bette noire, the surplus of Expo parking.